The Rice Lake Weighing System DeckHand is designed to handle the toughest of jobs. The two large rubber wheels are positioned higher than the bottom of the platform; allowing the wheels to touch the floor only when the unit is tilted back for movement. The design gives you a completely flat and stable surface to use during weighing procedures. The platform is able to weigh perfectly on all corners, meaning that off center or uneven weight distribution won't affect the accuracy of the scale. 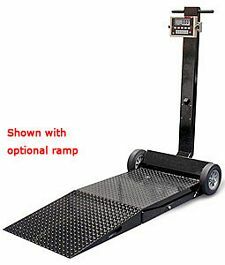 Ramp assembly, 500/1,000 lb, mild steel, 25" x 27"
Ramp assembly, 2,000 lb, mild steel, 25" x 27"
A portable scale requires portable power. The DeckHand is equipped with the IQ plus 390-DC battery-operated indicator. The indicator is attached to a swivel mounting bracket which gives operators a clear view of its readings no matter where the scale is located. The RL1260 aluminum load cells are configured with a clam shell for additional load cell protection.